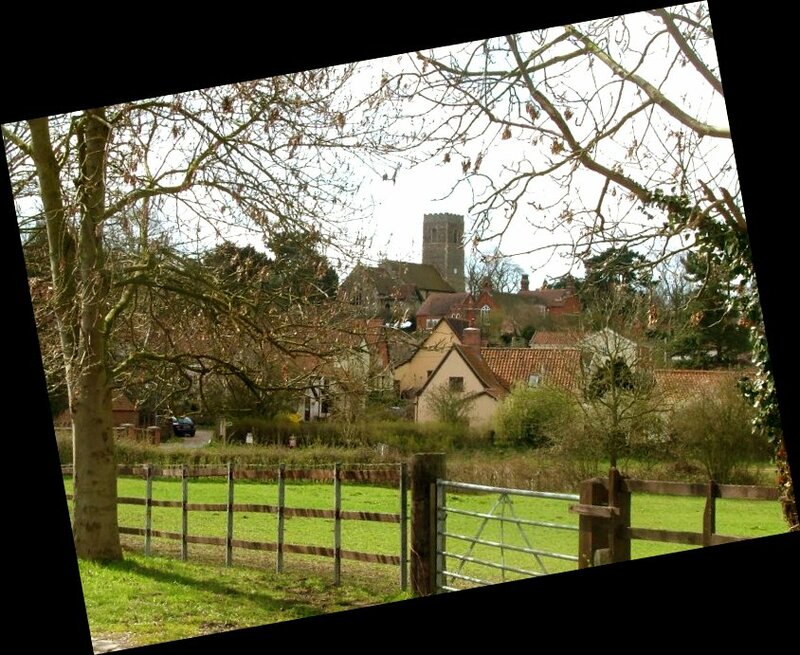 This is a beautiful village, just beyond the Ipswich borough boundary in the valley of the River Fynn. Trees climb the east side, and on the other the houses build to the magnificent sight of St Martin crowning the hill top, the roofs huddling around it. 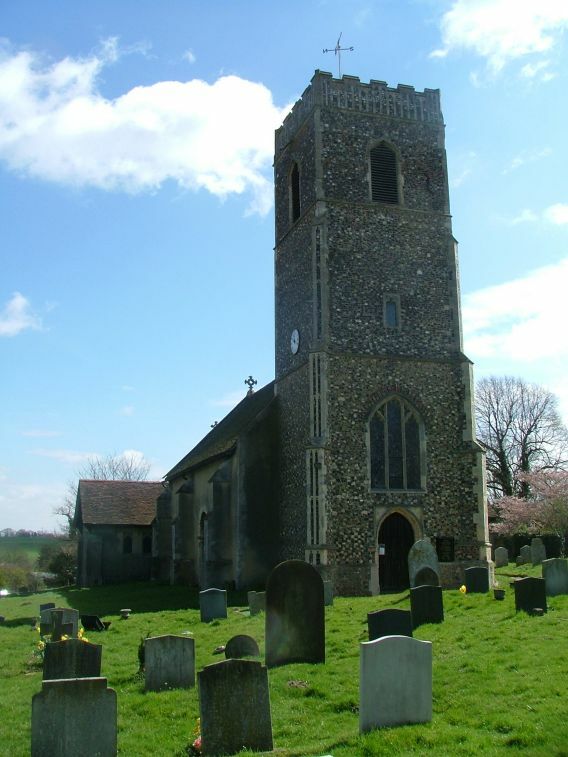 Back in the late 1990s, this was one of the first churches I visited for the Suffolk Churches site. In those days, I was not yet hardened against suspicious keyholders, and the third degree I got here did nothing to enamour me of the church. Coming back in 2006, things were quite different. 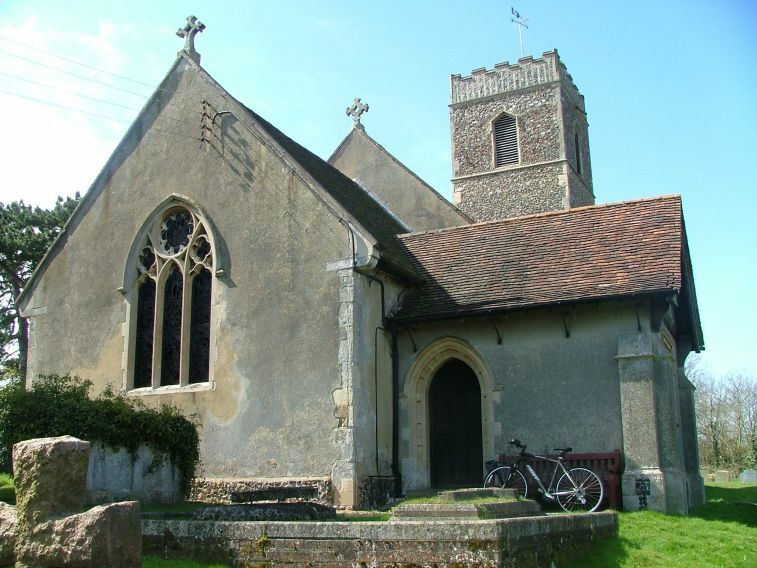 Although the church is still kept locked, which is unusual for the Ipswich area, the keyholder was now a friendly, jovial Scottish man who could not have been more helpful and welcoming. 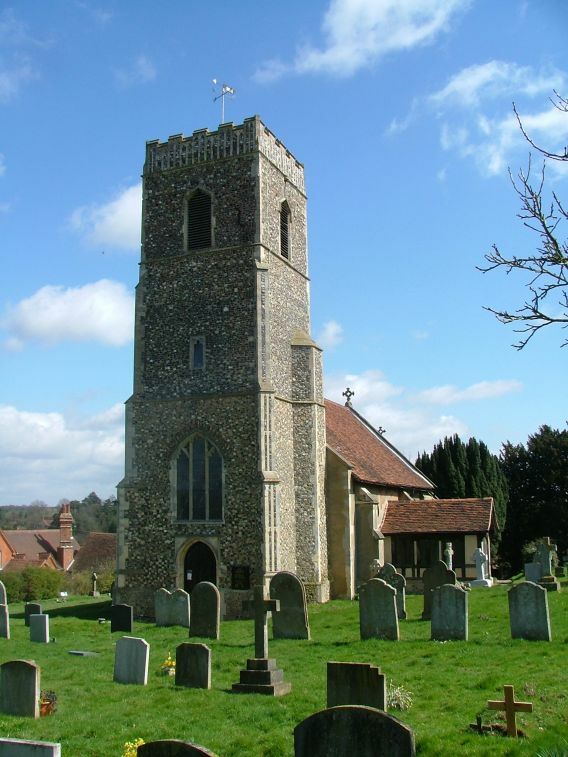 There have been changes at Tuddenham St Martin, and I have changed too. 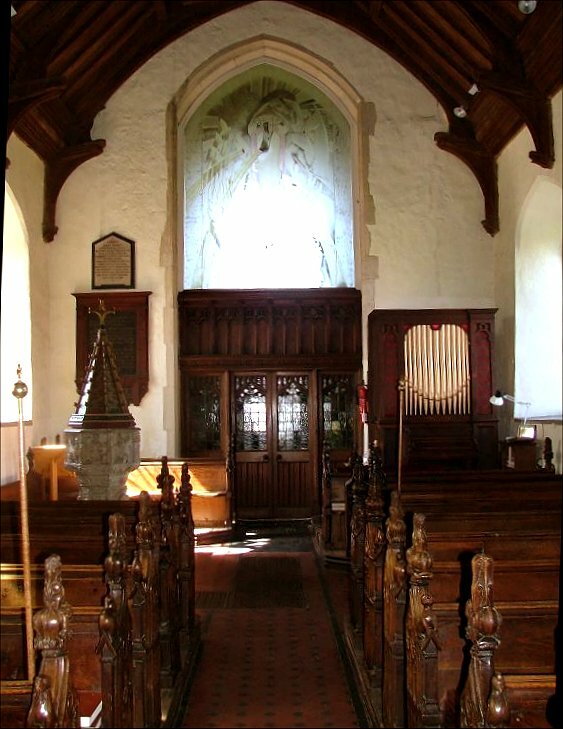 I was hard on this church in my original entry, criticising Cautley's furnishings for their dourness, the 19th century glass for its gloom, and expressing my revulsion at a hideous patterned carpet in the chancel. 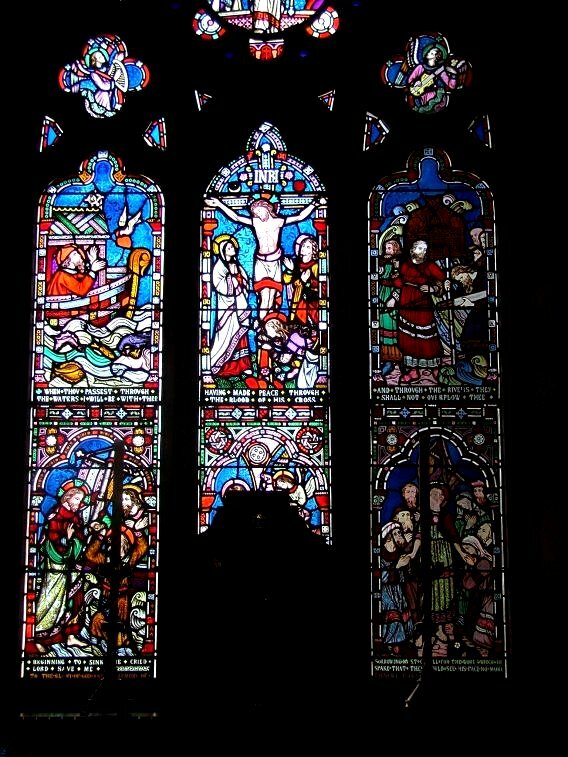 Since my first visit, I have learned a great deal about Victorian windows, and have even come to appreciate the 1930s sobriety of Cautley's work. I wondered if I would feel differently about St Martin, coming back to it now. A fine Norman north doorway greets you at the top of the hill; on this bright day in early spring it was difficult to photograph. To the east of it is a substantial 19th century vestry. At the other end there is a west door, and a blocked door to the 19th century south porch, now successfully converted into a super little meeting room. In the Victorian use of timber here, you may detect the hand of local architect John Corder, and you'd be right. And in addition to Cautley there is an even more famous local artist waiting inside, as we will see. You step into a cool darkness, especially noticeable if it is a bright day outside. There is a quietness that matches the shadows. 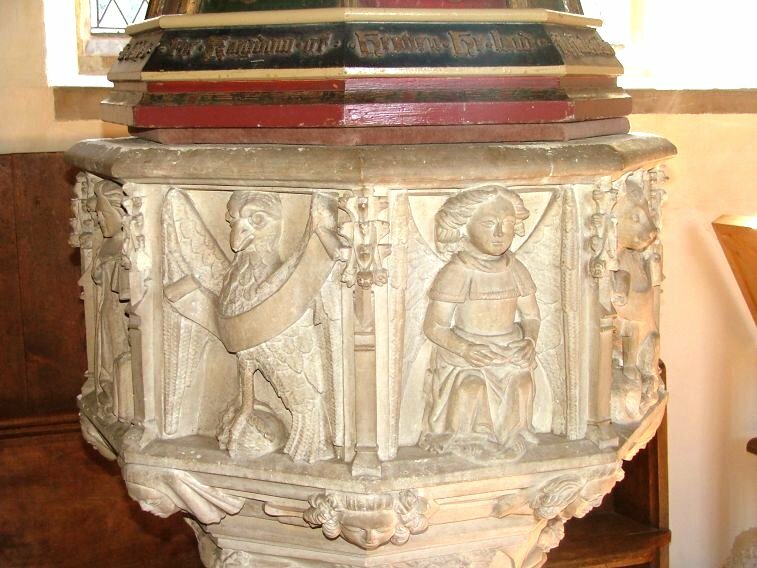 At the west end, the font is both spectacular and interesting. 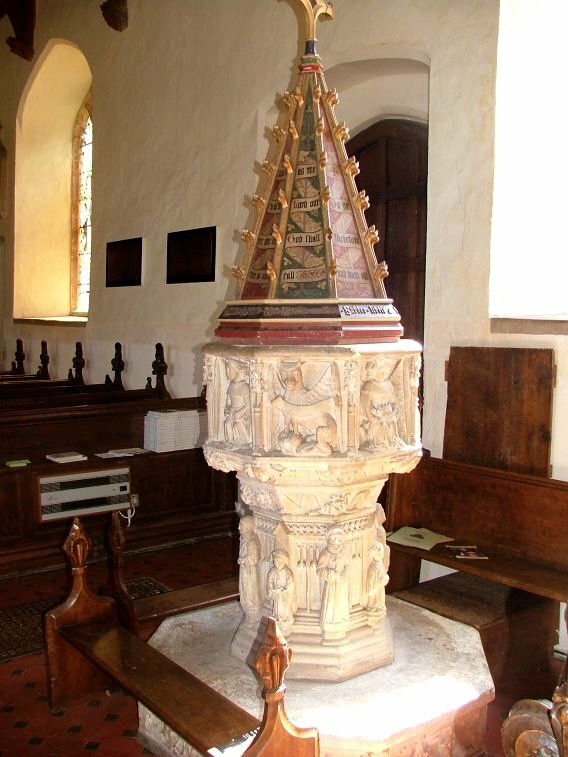 It is surmounted by a crocketted cover painted with texts, and bears a dedicatory inscription from 1433. 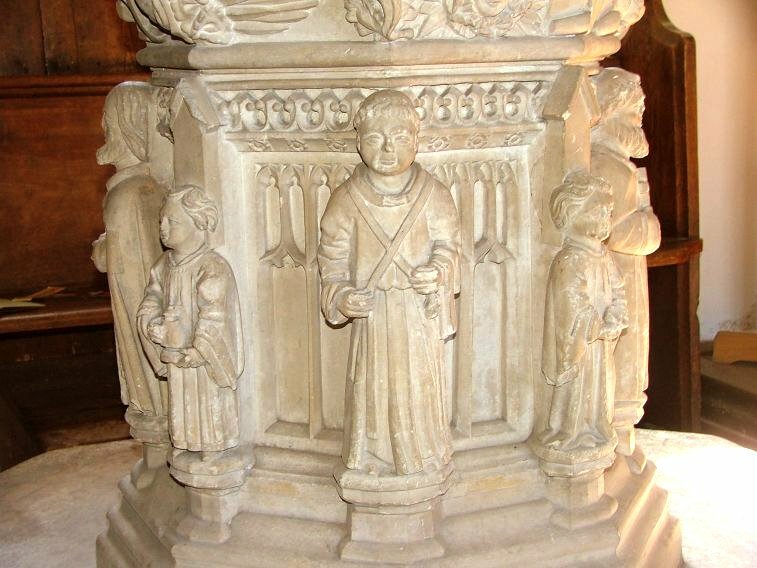 The pillar carries an unusual array of figures, albeit recut; priests and acolytes bearing bread, a chalice, a basin and a missal. 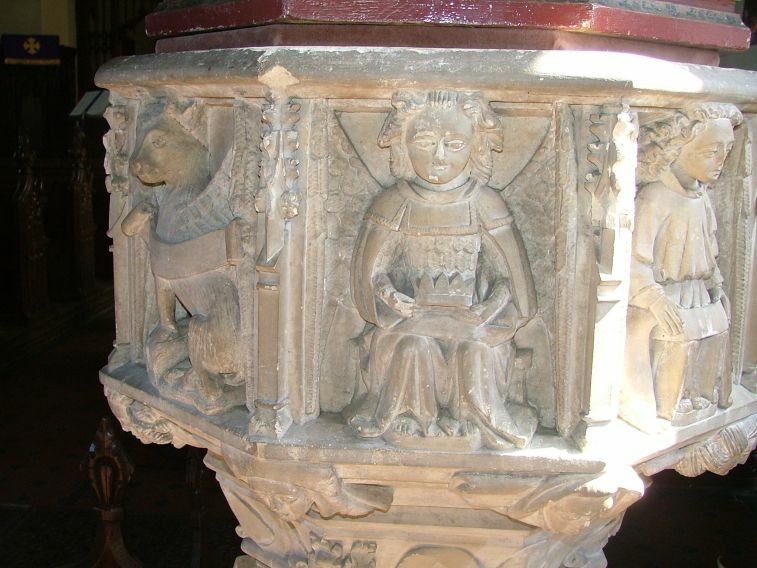 On the bowl above, angels intersperse with Evangelistic symbols, except that one of the panels shows a woman kneeling at a prayerdesk. 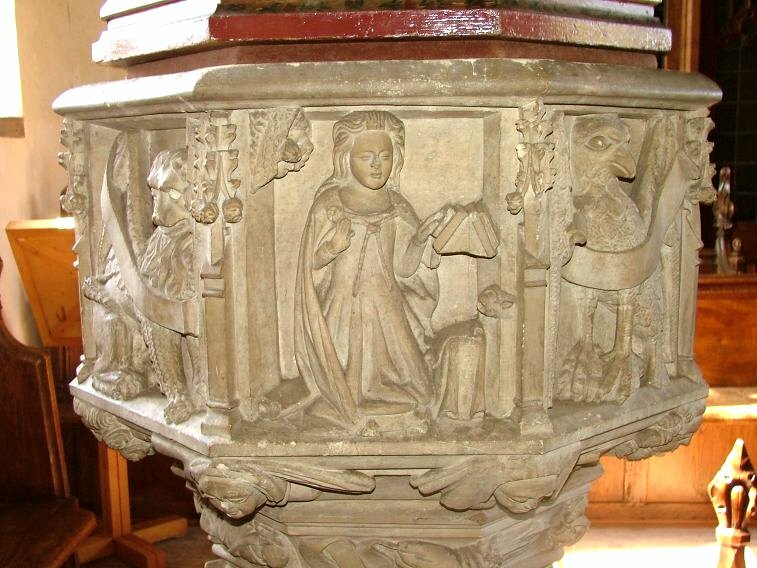 This may be intended as Mary of the Annunciation, or it may just be the donor Agnes Silvester, showing her piety. 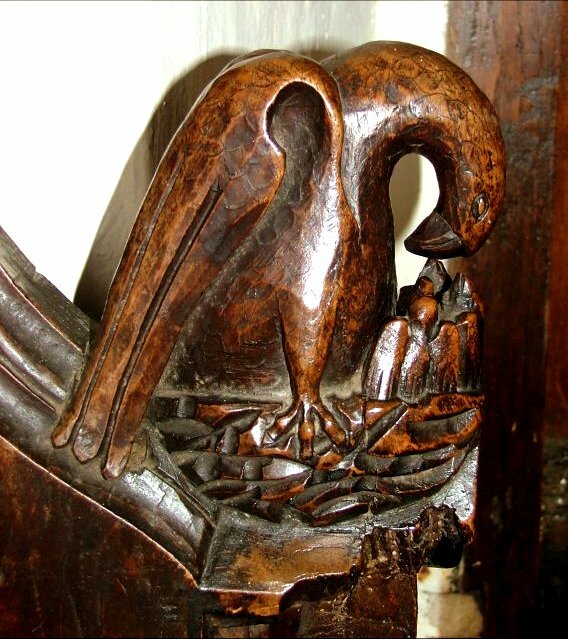 There are a couple of fine medieval bench ends; the pelican in her piety plucks at her breast to feed her young. 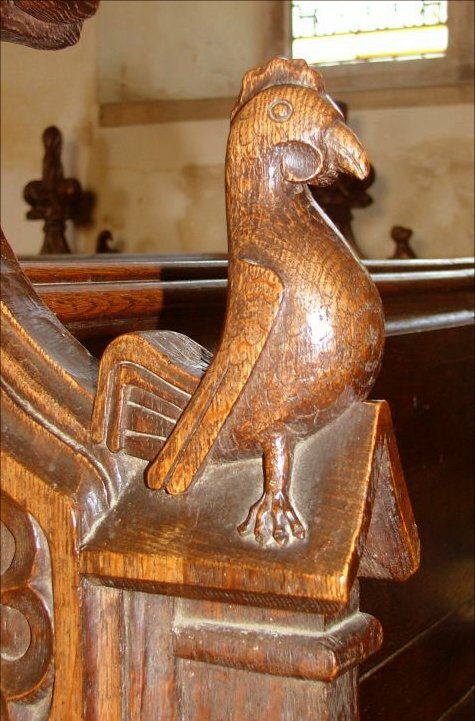 This is the same subject as occurs at nearby Great Bealings, almost certainly the work of the same carver. 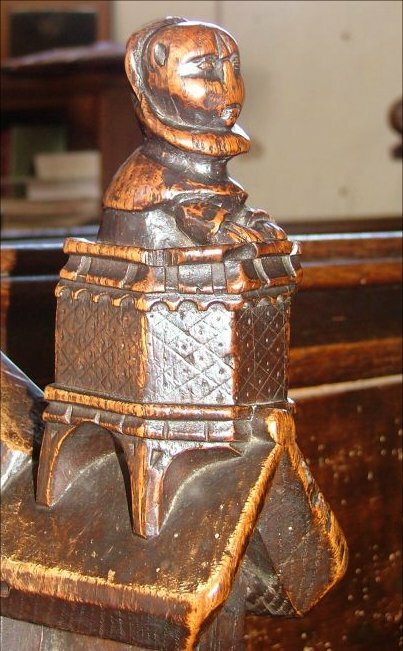 There is also a fine figure in a pulpit, and a cheeky monkey. 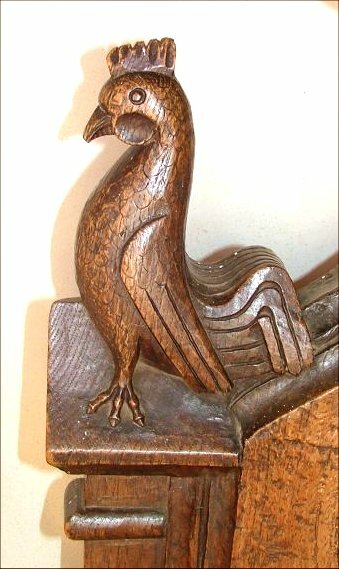 There are several good Victorian copies as well, the work of that great craftsman Henry Ringham, who is always to be admired. Like Corder, he has a street in Ipswich named after him, and his work can also be found in profusion up the road at Great Bealings. This is not as dramatic an interior as that church, and it is possible not to notice them, but I quite like that; everything works together to create an overall feeling of quiet. 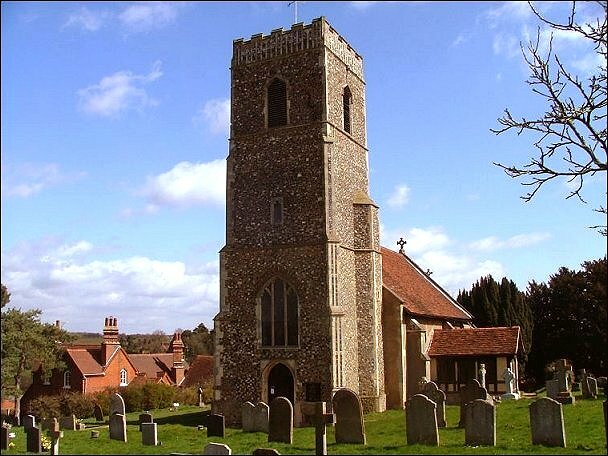 Indeed, Ringham is so good that you have to look closely to see what is medieval and what is Victorian. 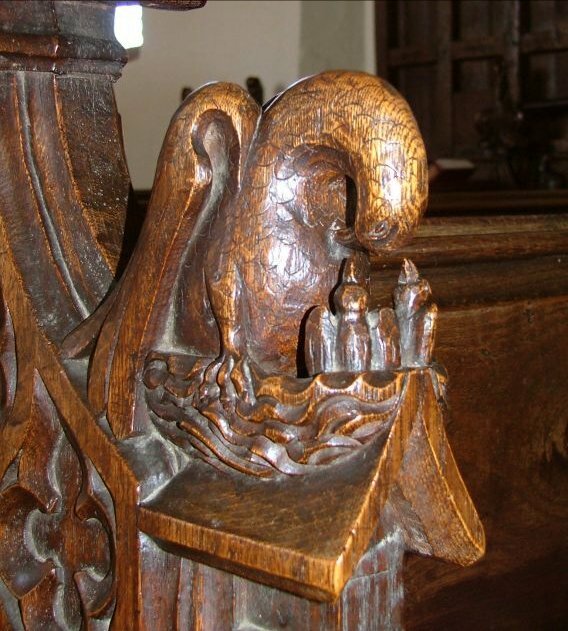 Can you date the six bench ends shown here? Answers below. 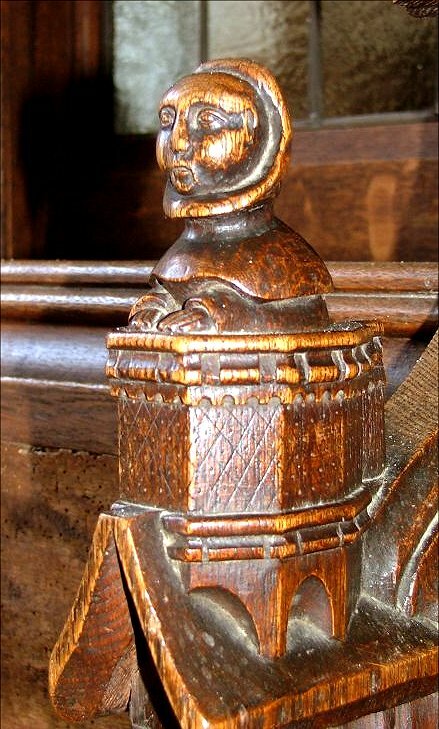 In my first entry for St Martin, I observed that the church had been well and truly Cautleyed. 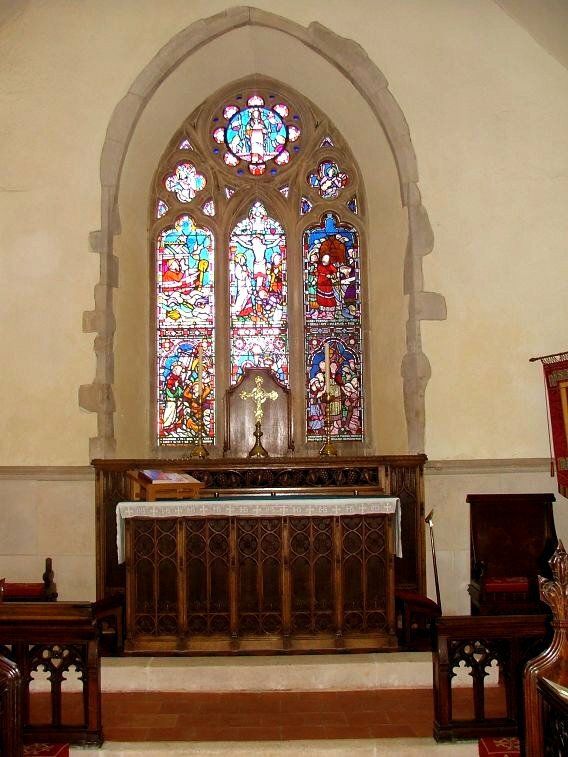 His is the rather gloomy screen, and matching altar-piece. Cautley lived at nearby Westerfield, whose church he helped beautify greatly. If there was rivalry between the two villages, one might almost think that the work here was an act of sabotage. 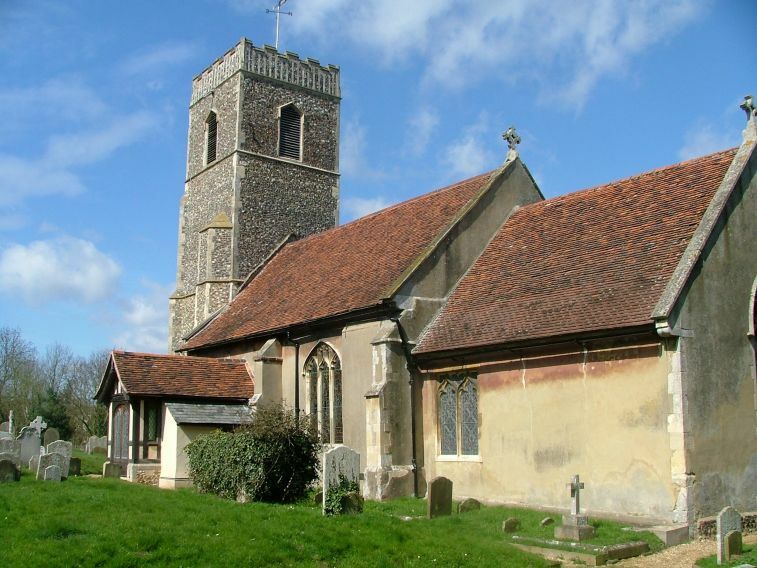 However, what had made the chancel so bleak last time, the patterned carpet, has now been removed, revealing 19th century tiles and earlier brick pantiles. These are lovely, and I could see what Cautley was getting at. 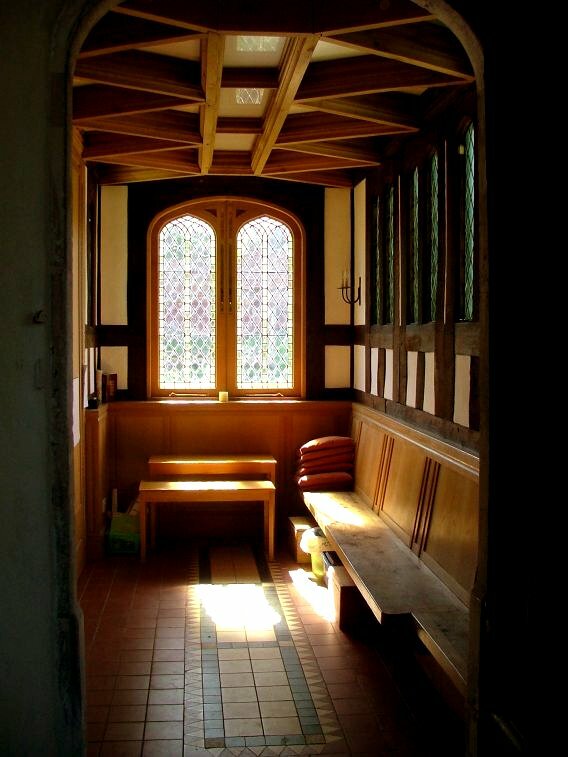 It is a serious space, and perhaps rather out of keeping with the kind of white, simple, light spaces that seem to suit modern Anglican spirituality. But it is a period piece, and of its kind a very good one. 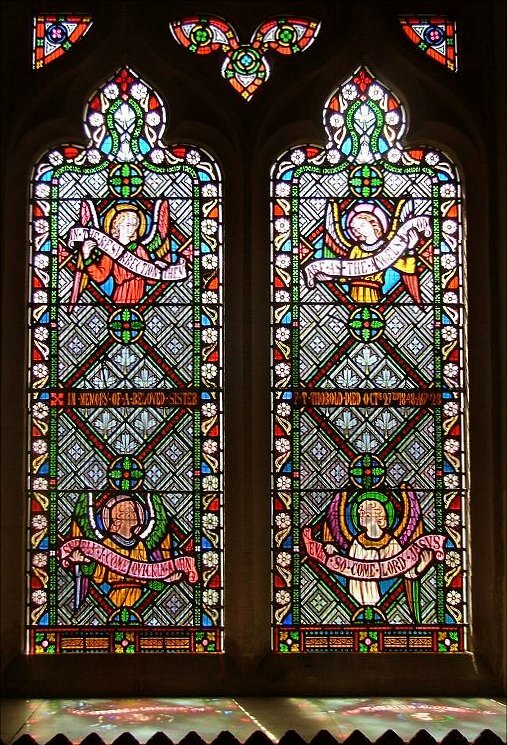 St Martin has a fine collection of early 20th century glass. 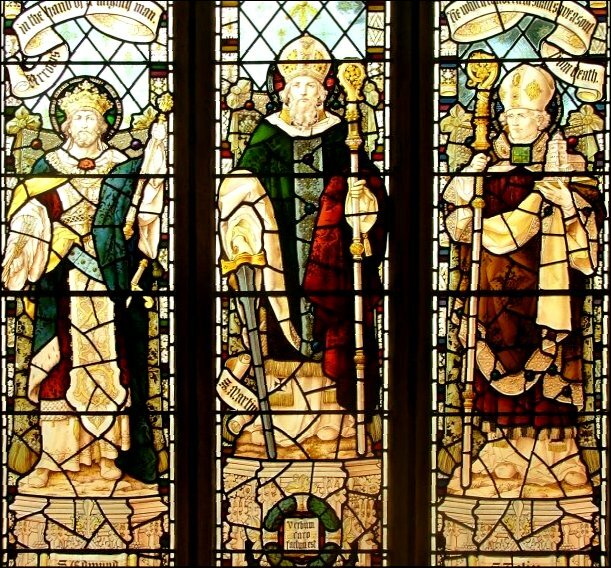 There are good windows to north and south of the nave; that to the south is by Percy Bacon shows Saints Edmund, Martin and Felix. Mortlock notes a curiosity, for the dedicatory inscription includes someone who was still alive at the time. 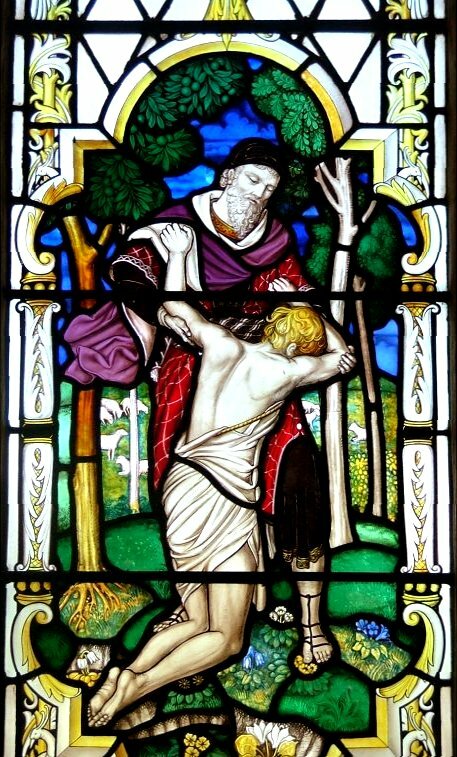 I particularly admired the three-light sequence opposite of the Prodigal Son; this can be a mawkish subject, but here the parable is handled thoughtfully, teaching the essentials of the story. It is by Christopher Webb, an increasingly well-thought of artist. But the most dramatic glass has been put in place since my last visit. 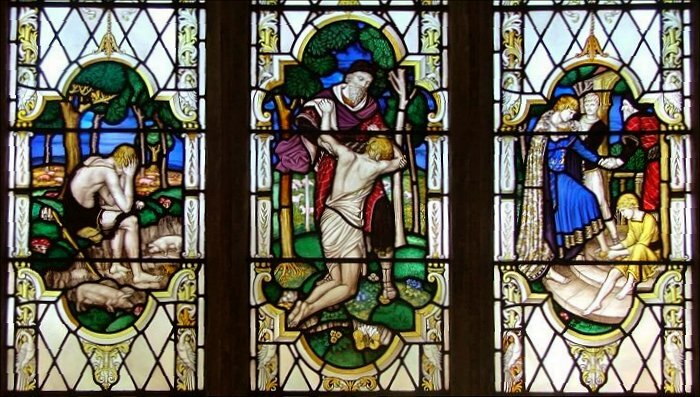 This is the parish millennium window in the top half of the tower arch, screening the ringing gallery from the nave. 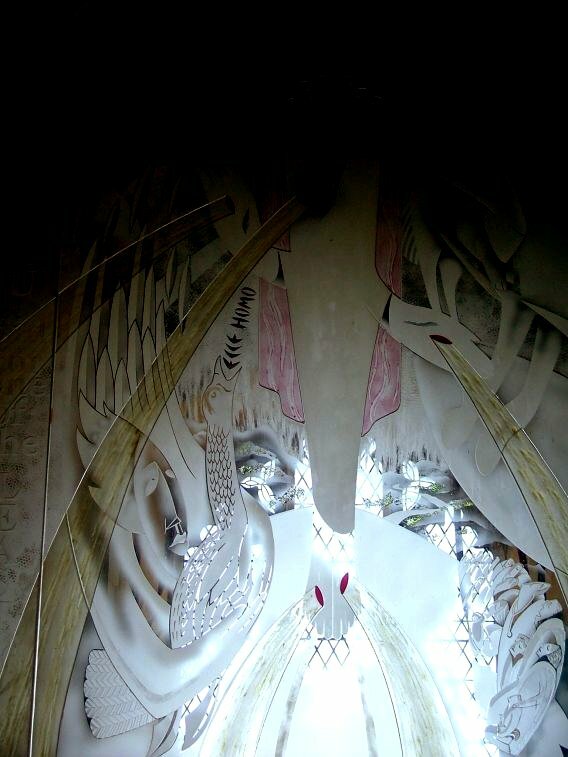 It is etched, and depicts the risen Christ. 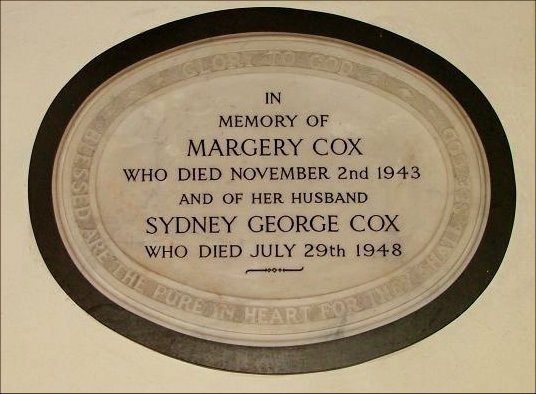 A memorial in the chancel is to Sydney Cox, who Mortlock notes was a solicitor concerned with the divorce of Wallis Simpson which enabled her to marry Edward VIII, precipitating the abdication crisis of 1936. 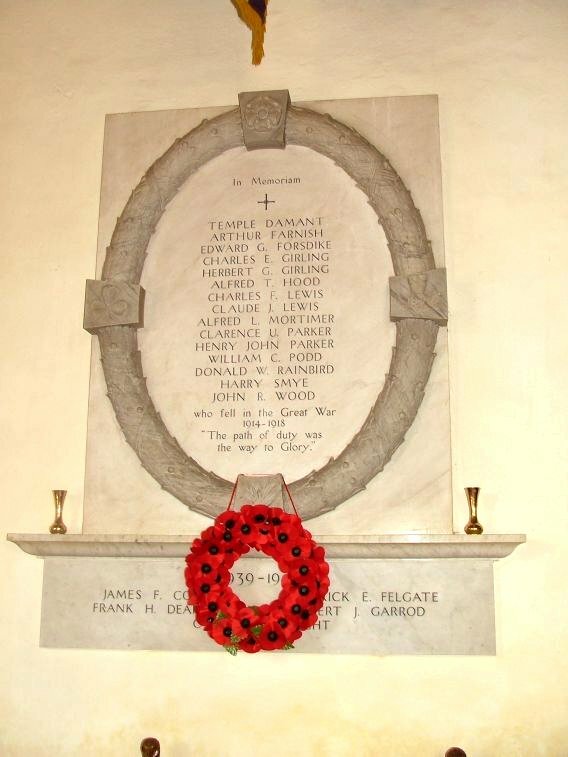 The memorial doesn't mention this, of course. 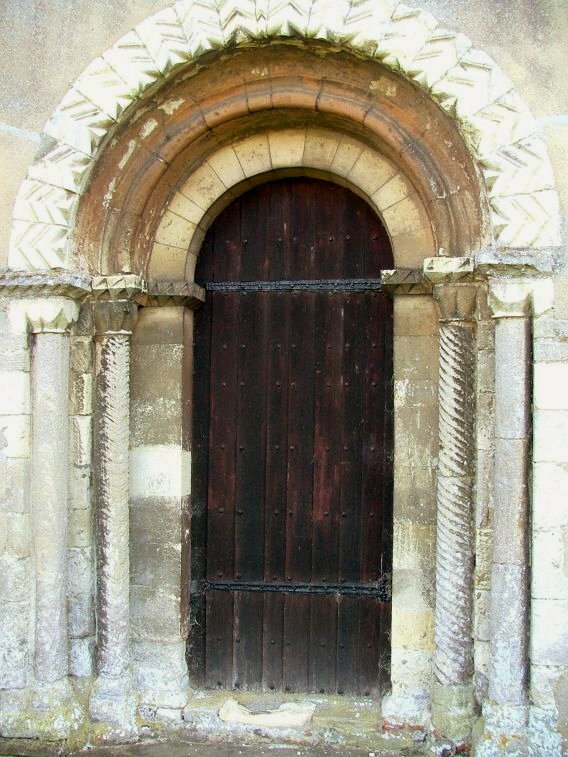 The north doorway is blocked off inside, and the entrance to the church now, as at Westerfield, is from the west. 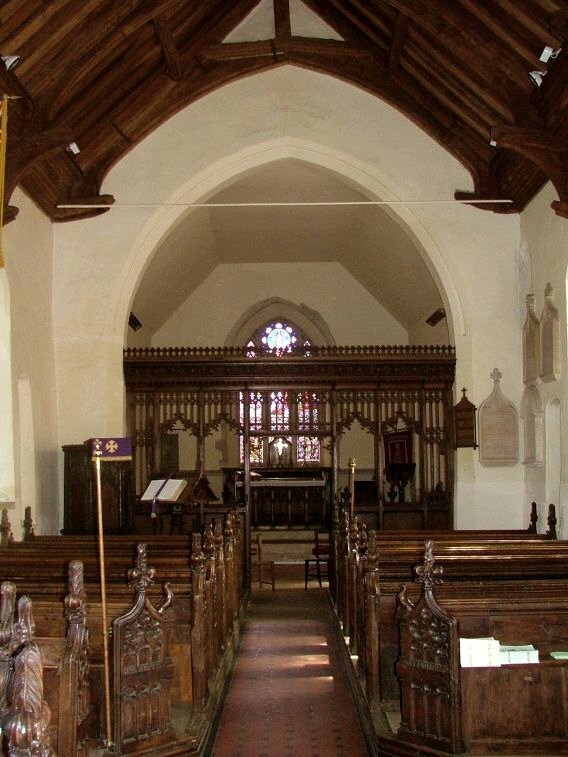 The former south porch is a delightful surprise inside, converted into an area for children during the service, and coffee afterwards. 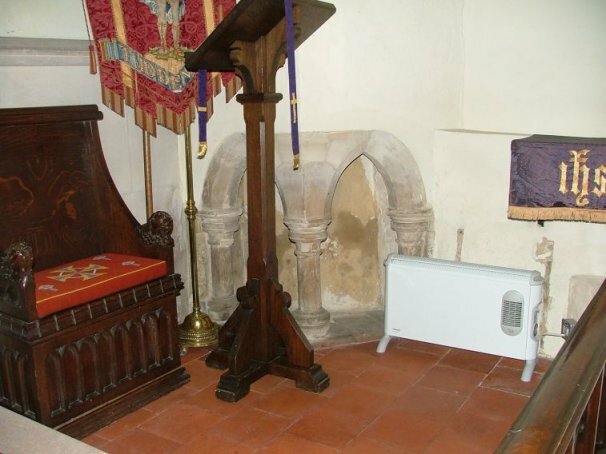 It is light, cheerful, and has the great blessing of lavatories. 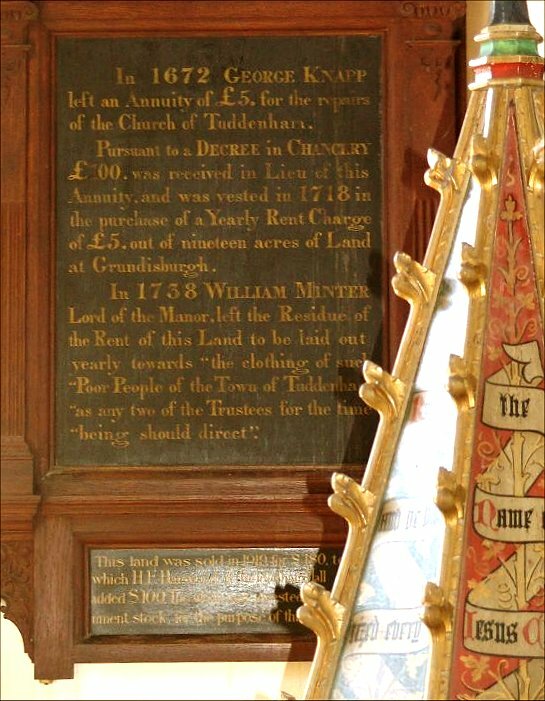 This is obviously a lively, busy parish, and I'm sure that Cautley would be very pleased with the way its interior integrity has been carefully nurtured. I was wrong about St Martin - it is a delightful church.